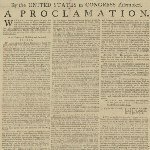 On April 11, 1783 the Continental Congress issued a proclamation “Declaring the cessation of arms” against Great Britain. Four days later the Congress approved the preliminary articles of peace. Finally, on January 14, 1784 the Treaty of Paris was ratified. The process of ratification did not go smoothly. The winter of 1783–1784 was very severe, therefore only delegates from seven states managed to arrive and were present in Congress. The Articles of Confederation stated that nine states of the thirteen were required to enter into a treaty. Some delegates were convinced that seven states were enough to ratify the treaty, but Thomas Jefferson and his faction insisted that a full nine states were required otherwise Britain would have an excuse to nullify the treaty. In the end, the treaty was ratified by nine states as delegates from South Carolina and Connecticut arrived at the last moment. The American Revolution was officially over.